Why focus on smarter investments and sustainable financing? America’s health system has evolved considerably in recent years, and is poised for even greater transformation. But its true potential will not emerge until we better fulfill our shared priorities, reshape regional health economies, and deliver dependable resources for the most promising innovations. • new kinds of investments to alter long-term trends (“sustainable financing”). At present, however, most reformers engage only some of the right people, and they work in short-term projects backed by modest, ad hoc funding. Inspiring efforts that depart from this pattern are now emerging all across the country, but compelling examples of inclusive, place-based stewardship coupled with sound, system-wide strategy and sustainable financing are rare. To help regional leaders better assess and drive progress, we created a developmental framework—the Pathway for Transforming Regional Health. 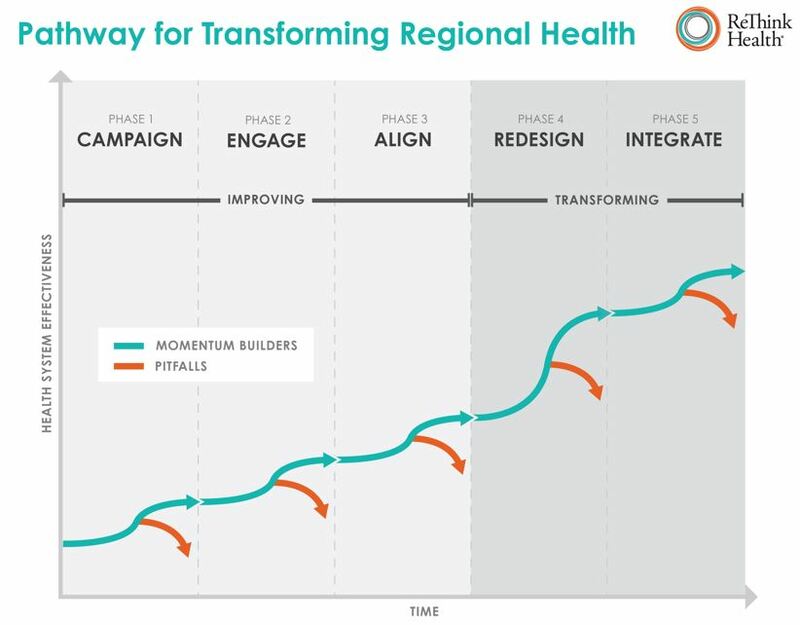 It summarizes hard-won lessons from veteran change-makers about what it takes to move through five distinct phases, beginning with a focus on short-term targeted campaigns in Phase 1 toward a more inclusive and integrated health ecosystem in Phase 5. For each phase, there are conditions that could build momentum as well as pitfalls that threaten to disrupt progress. Here is a summary of the main financing tasks at each phase. Savvy leaders may make initial progress in the early phases of the Pathway. But they must maintain momentum and continually up the ante to succeed at a system-wide scale over time. Decades of past experience show that without more sustainable financing and stronger economic incentives that are in sync with the wider regional economy, most early stage reforms are likely to rebound back to the status quo over the long term. If health reform is to move beyond making temporary improvements on the margins into a mainstream way of doing business differently, then new forms of investment and financing are imperative. Efforts to progress beyond alignment toward a whole-scale redesign of business as usual, in particular, are fraught with powerful pitfalls precisely because the stakes are so high–and stakeholder interests can become so entrenched. This is the period where the limits of existing structures and resistance from those who defend the status quo begin to take their toll. This is the time when innovators face a stark choice: either stall and remain stuck in a cycle of reform and rebound or step up and reshape how decisions are made and how resources flow. Yes, this is an astonishing period of experimentation in the U.S. health system. But open questions remain about whether current efforts will indeed result in a new way of doing business in an economy that truly values health in its broadest sense. Most signs point to this as an area of great vulnerability—and enormous untapped potential. Just how much potential is the subject of the next section, where we examine the health and economic opportunities that could be unlocked.